During my JC days my project work was on MM Lee so I read all the books I could get my hands on about him. 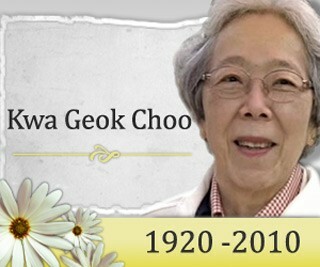 In his memoirs I learnt about Mrs Lee, her academic brilliance and all. I really admired the fact that she managed to balance all the pressures of work (She formed Lee&Lee! ), raising a family of three children and most importantly, playing the supporting role of a man who led our nation. Recently my school assignment led me to read the interview by New York Times and MM Lee was talking about the difficulties she had been facing after her debilitating stroke. The last challenge in her life was probably the most difficult one but I’m glad that it’s finally over for her. Rest in peace Mrs Lee, you will be greatly missed.